Exocrine pancreatic insufficiency, also known as EPI, is a serious condition. Fortunately, it's easy for your vet to detect EPI and once detected, it's relatively easy to treat so your dog can return to normal health. Your dog's pancreas is responsible for producing insulin that helps regulate sugar levels. In addition to being responsible for the production of insulin, the pancreas also plays a critical role in producing enzymes to aid in digestion. When the pancreas does not produce the correct amount of digestive enzymes, this leads to EPI, which affects your dog's gastrointestinal system. Pancreatic Acinar Atrophy: Pancreatic Acinar Atrphic, PAA, is the most common cause of EPI. Chronic Pancreatitis: If your dog has chronic pancreatitis, this can become EPI. 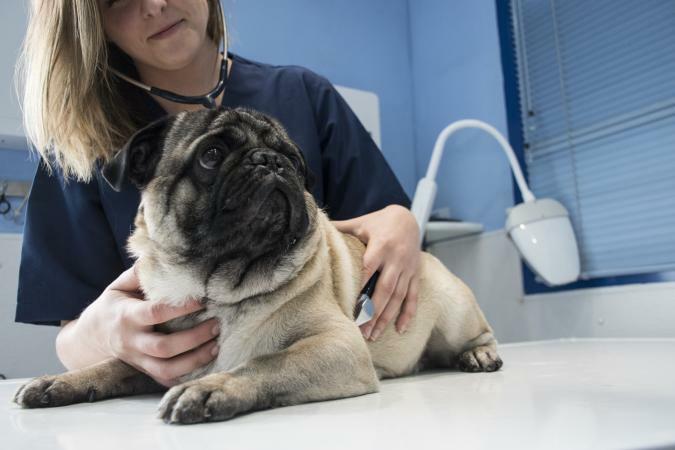 When this happens it is especially dangerous because many pet owners continue to treat the pancreatitis without realizing the disease has advanced into the more severe EPI. Congenital hypoplasia: Congenital hypoplasia is when your dog was born without a fully functional pancreas. Increased appetite: Your dog will appear to be hungry all the time. Your dog is not digesting properly, and his body will not detect a 'full' feeling. You may notice him even eating unusual things including plants and dirt. Weight loss: When your dog has EPI, regardless of how much he eats, his body is essentially starving. The food your dog does consume passes through the body without absorbing the proper nutrients necessary for survival. These signs and symptoms may be apparent immediately or appear gradually. Serum sample: Measures levels of Trypsinogen (TPI) in the serum of your dog's body; a dog will have reduced amount of TPI if EPI is present. Blood sample: The complete blood count (CBC) will be analyzed. Urinalysis: Urine analysis, as well as blood samples, are often taken to rule out any additional conditions your dog may have. Feces analysis: The feces provide the veterinarian with a significant amount of information regarding diagnosis of EPI. The feces will show large amounts of undigested fats due to the enzymes necessary for digestion being limited or nonexistent. A low fat, low fiber diet is also often recommended. This diet is easier for your dog to digest while recovering from this condition once on the supplements. You may think the low fat, low fiber diet would result in him still feeling hungry but you will notice your dog becoming satisfied once again with what he is eating. Antacids: The antacids will reduce the pH level in the stomach. Antimicrobials: Your vet may consider this option if your dog does not respond well to enzyme supplementation. The antimicrobial is introduced in addition to providing the enzyme supplement. Dogs who have been diagnosed with EPI should never be fed high-fat or high-fiber diets. Fat and fiber is difficult to digest and may result in digestive problems in your dog. German Shepherds and Rough-Coated Collies are known to develop Endocrine Pancreatic Insufficiency more than other dog breeds. Research has often found young adult dogs are most prone to developing this condition. Dogs with EPI can begin to lead a normal life following treatment. However, this is a condition which will require ongoing treatment and observation. Preventing it is difficult as it may occur at any age. However, if you know your female dog has Exocrine Pancreatic Insufficiency you should not allow her to have puppies. Monitoring your dog to ensure you 'catch' the condition early is also critical to ensure optimal health and quick recovery for your dog.